David M. Lee is Professor of Physics at Texas A&M University (2009-present). Other institutional affiliations include Cornell University. His research interests include superfluidity and condensed matter. January 20, 1931Birth, Rye (N.Y.). 1952Obtained AB, Harvard University, Cambridge (Mass.). 1955Obtained MS, University of Connecticut, Storrs (Conn.). 1959Obtained PhD in Physics, Yale University, New Haven (Conn.). 1959 – 2009Instructor to Associate Professor of Physics (1959-1968); Professor of Physics (1969-1999); and James G. White Distinguished Professor of Physical Science (1999-2009), Cornell University, Ithaca (N.Y.). 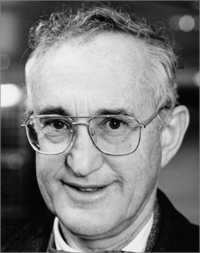 1966 – 1967Guest Associate Physicist, Brookhaven National Laboratory. 1974 – 1975Visiting Professor, University of Florida. 1990 – 1993Chair, Committee on Fundamental Constants and Standards, National Research Council. 1994Visiting Professor, University of Florida. 1996Awarded Nobel Prize in Physics with Douglas Osheroff and Robert Richardson "for their discovery of superfluidity in helium-3". 2009 – presentProfessor of Physics, Texas A&M University, College Station (Tex.). Advised by Lee at Cornell University, "Electron spin resonance studies of hydrogen and deuterium atoms in krypton-helium condensates." Advised by Lee at Cornell University in physics. PhD advisor at Yale University, "The thermal conductivity and the density of liquid He3." Advised by Lee at Cornell University, "The field dependence of catastrophic relaxation in superfluid (3)He-B." Advised by Lee at Cornell University, "Impurity -helium solids." Advised by Lee at Cornell University, "Willingness to pay for conservation programs: A contingent valuation study of the Galapagos National Park." Advised by Lee at Cornell University, "Compressional cooling and ultralow temperature properties of He3;" Lee's teaching assistant at Cornell University; and shared 1996 Nobel Prize in Physics with Robert C. Richardson for discovery of superfluidity in helium-3. Advised by Lee at Cornell University, "Agricultural Best Management Practices in the New York City source watersheds: Hydrological, economic and policy analysis." Shared 1996 Nobel Prize in Physics along with Douglas D. Osheroff for discovery of superfluidity in helium-3, and both employed at Cornell University. Advised by Lee at Cornell University. Advised by Lee at Cornell University, "Rebalancing goals in the National Park Service: Achieving reform in a federal agency." Received 1981 Oliver E. Buckley Condensed Matter Prize. Chair, Committee on Fundamental Constants and Standards. Obtained PhD in Physics (1959). David M. Lee papers, 1935-2009. Low temperature physics: a historical perspective [videorecording], 2006 March 16. David M. Lee Nobel Prize biography.